Learning to speak the language that your grandparents spoke is a precious gift for many people. This is especially true for Indigenous people, many of whom lost their languages as a result of colonialism. Last week (October 1-7) was First Nations Public Library Week in Ontario, a great time to explore Indigenous languages. Here are some books and other resources from your Library’s Indigenous Knowledge Centres to help you find language resources for all ages. This book is by Trevor Greyeyes & Maeengan Linklater and edited and translated by Patricia M. Ningewance. It is a simple to use guide for children from eight to fifteen and for teachers, parents, caregivers and grandparents who want to speak Ojibwe with the child in everyday situations. The book clearly states that it is not intended as an instructional language grammar, and stresses that this guide is intended for fluent speakers as well as beginners. The authors emphasize the importance of the Seven Grandfather Teachings and respectful behaviour. A pronunciation guide is provided. Highly recommended. Author Patricia M. Ningewance uses the Lac Seul, Ontario dialect for the vocabulary. The guide is organized into everyday conversations of daily living in common situations. The book contains a list of common Manitoba, Saskatchewan, Minnesota and Ontario place names. There is an extensive glossary of English words with corresponding Ojibwe terms. The introduction discusses the Ojibwe language and provides information about pronunciation, writing systems, and grammar. This book is recommended for anyone working with Ojibwe speakers or interested in the Ojibwe language. This course includes Lessons 1-10 from the Ojibwe Level 1 Program – 5 hours of audio-only effective language learning with real-life spoken practice sessions. Get a chance to test drive the incredibly effective and efficient, world-famous Pimsleur Program. Each lesson provides 30 minutes of spoken language practice, with an introductory conversation, and new vocabulary and structures. Detailed instructions enable you to understand and participate in the conversation. Practice for vocabulary introduced in previous lessons is included in each lesson. The emphasis is on pronunciation and comprehension, and on learning to speak Ojibwe. This wonderful book comes with a CD of songs collected and recorded by Jim Hollander, transcribed and translated by Oji-Cree and Ojibway educators from the Matawa First Nations. The 14 songs were written and recorded during a Sing Along Songs Workshop at the Eabametoong First Nation in 2007. The words for all the songs are written in English and syllabics. Born and raised in Norway House, Cree author Ken Paupanekis wrote this handy little book to promote the use of the Cree language everywhere it might be used, by speaking it. The cover says: “What to say when visiting Cree People in Communities, at Airports, Conferences, in Hospitals, in Courts, Cities, Stores and in the Wilderness”. 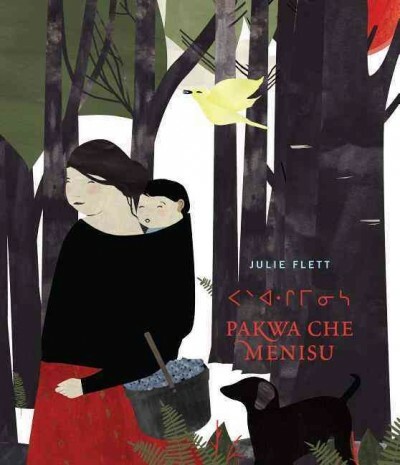 Cree-Metis author and illustrator Julie Flett tells the story of a young boy picking wild blueberries with this grandmother in this beautiful picture book written in the Cree language. She notes, “This book in set in n-dialect, also known as Swampy Cree from the Cross Lake, Norway House area.” The story is told in both spelled-out Cree and syllabics, and the book includes a syllabic pronunciation guide. Your Library card gets you access to the online language learning tool Transparent Language. This fun, interactive program includes lessons in how to speak over 95 languages, including Cree, Oji-Cree, and three different dialects of Ojibwe. Go to www.tbpl.ca/learnalanguage and follow the link to get started. Create an account with your email address to log in, and track your progress. Joanna Aegard and Robyn Medicine – www.tbpl.ca. If you have a comment about today’s column, we would love to hear from you. Please comment below!